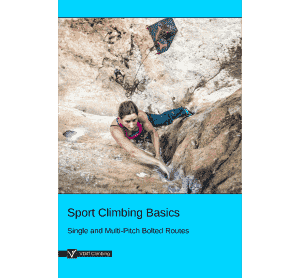 'Nylon or Dyneema Slings?' 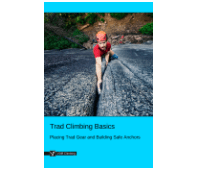 is part of the e-book - Trad Climbing Basics. Usually around 16-20mm wide, nylon climbing slings are much bulkier (and more durable) than lightweight 6-14mm Dyneema slings. 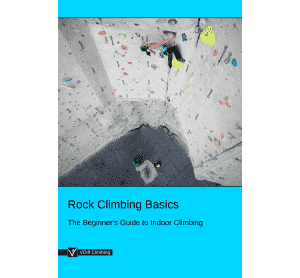 This makes them the best choice for situations such as extending a belay device, replacing anchor webbing or attaching yourself to an anchor before abseiling. Nylon webbing is cheap and easy to buy in bulk. It holds knots better and doesn’t melt as quickly as Dyneema. Nylon will also stretch much more than Dyneema to help absorb forces, thereby dynamically absorbing the energy of a falling climber. Dyneema (also known as Spectra or Dynex) is incredibly strong for its weight and is more abrasion and cut-resistant than nylon. Dyneema can't be dyed, so slings are always white, often with a coloured thread running through them too – this is a nylon ‘filler’ that is used to help hold the sling together. Dyneema folds up very small so racking them is easy, especially 60cm slings racked as extendable quickdraws. 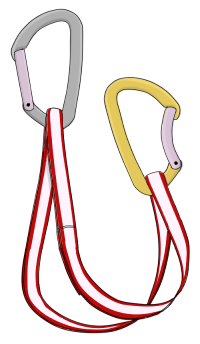 Due to their thin diameter, they can be threaded through small gaps where nylon slings are too fat to fit, and are great for tying-off pitons. Dyneema doesn't absorb much water, making them a smarter choice for winter climbing where your nylon slings will freeze stiff. If Dyneema is the same strength as nylon, but much lighter, smaller and more abrasion and water resistant, why would you ever get nylon slings? Dyneema only stretches three to five percent, so there will be minimal dynamic absorption of falls through the sling – it's all reliant on your rope. 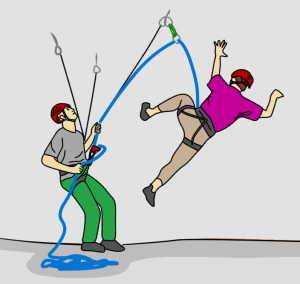 If you fall without a rope in the system (e.g: when attached directly to an anchor with a sling), the resulting fall will be as abrupt as if you were attached by a length of steel cable. The repeated flexing of Dyneema degrades the fibers much quicker than nylon, especially when knots are tied in it. Dyneema quickdraws, slings and cam slings need to be replaced more frequently than the nylon equivalent. Dyneema is almost always more expensive than good old-fashioned nylon. Buying nylon helps you save money for more important things like climbing road trips. The lack of stretch means that energy is dissipated as heat rather than movement. As Dyneema has quite a low melting point compared to nylon, the heat generated can damage the material, causing it to fail. This effect is more apparent when knots are tied in the sling as the strands rub over themselves. 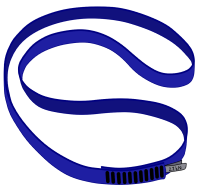 Knots in thin slings are also incredibly hard to unfasten if heavily loaded. Dyneema is much slicker than nylon. You can buy nylon cord and webbing off the spool in most climbing shops, and tie it together to create your own cordelette, prusik or sling of the desired length. Dyneema webbing, however, is only available in finished, sewn products. One reason for this is because a knot tied in Dyneema tends to pull through itself under load. The exception is Dyneema cord, which you can buy in raw lengths. Be careful though – the weakness in this super strong material is the knot that you use to tie it together. We recommend using a triple fisherman’s bend with long tails. The most important part of this knot is how well you fasten it – make it neat, tie it very tight and check it before each use. 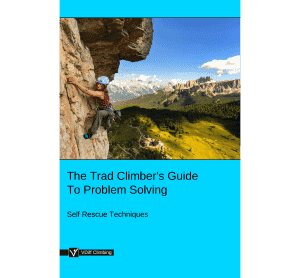 The same knot can be used if you must cut and retie your sewn Dyneema slings, such as threading a sling around a feature to back up an abseil anchor. While a water knot is the preferred choice for tying nylon webbing together, the triple fisherman’s bend is better for thin Dyneema. Because Dyneema is so slick, water knots pull through themselves at a lower force than the triple fisherman’s. When there is little rope in the system to soften a fall (such as falling on your first piece of gear), you can reduce the force on that piece (slightly) by using a nylon extender rather than Dyneema. As you climb higher and reduce the fall factor, it doesn’t really matter which material you use. If you fall when attached directly to an anchor with a Dyneema sling or cordelette, the resulting fall will put higher forces on the anchor than if you were attached with a nylon sling. Depending on the severity of the fall, this could cause internal injuries, break the sling or break your anchor. A much better alternative is to attach to the anchor with the rope. 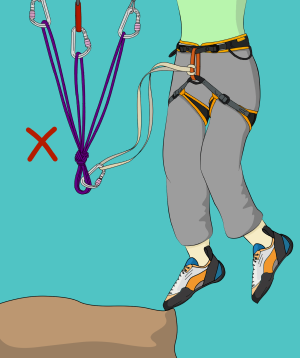 If this is not possible (such as when abseiling), make sure not to put yourself in a position where you could fall and shock-load the anchor, even if you are attached with a nylon sling. When aid climbing, it’s possible to take a static fall on a daisy chain if your next piece of gear fails. A nylon daisy chain will stretch more than Dyneema to absorb forces in this situation, but a much better solution is to improve your aid technique so that you are never in a situation where you will shock-load your daisy chain. Should You Buy Nylon or Dyneema Climbing Slings? For most situations, you should focus on using the sling correctly, rather than worrying about what material you should use. There are no definite rules for when to use either material. Both are good when used in the right way, but neither are perfect. Having a mixture of both on your rack keeps your options open. The key is understanding the advantages and limitations of each and using your knowledge to select the best type for the situation. Trad Climbing Gear > What Do You Need?